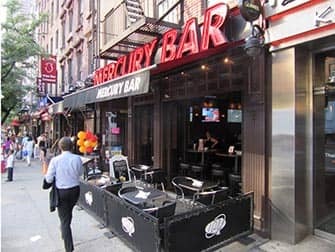 New York Midtown nightlife offers you a nice selection of bars. 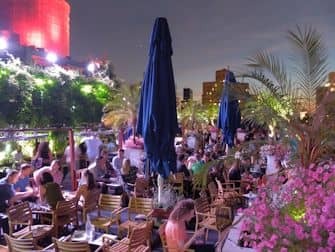 Whether you like a rooftop bar or a sports bar, you surely find something suitable. Don’t forget to bring your passport! A great club, especially in the summer. 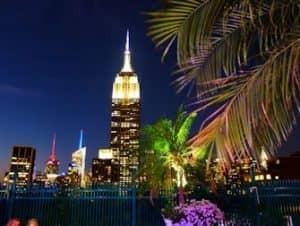 Here, you can sit on the rooftop with spectacular views of the Empire State Building. Doors open at 16:00, which also makes this a fun spot for an afternoon drink. Fridays and Saturdays it can be trickier to get in so do dress up well and absolutely no sneakers. Also in the weekends it’s mostly bottle service but on a weeknight you might be able to sit down too. 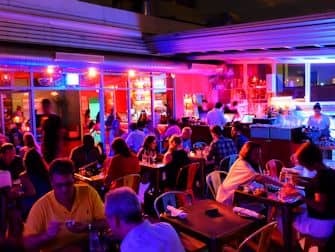 Cantina Rooftop not only offers delicious foods and drinks but also has a nice rooftop terrace where you can dine outside or have drinks. Reservations are recommended. 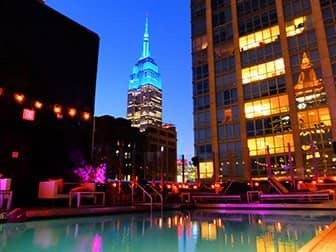 A nice club (lounge) with two floors on the roof of the Royalton Hotel (formerly known as the Gansevoort Hotel) where you can also dance. The pool is located on the top floor. Depending on the night and the amount of people there, both floors are not always open. In this sports bar, you will not find any tourists. On Sundays, you can see the New Yorkers watching their football or baseball. This is a small bar but with a lot of TV screens. Sit in one of the booths and order a beer with some finger food. There is no dress code.